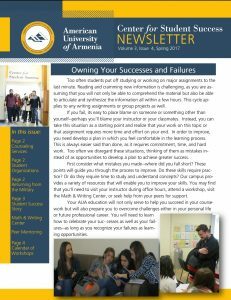 The American University of Armenia aims to establish a learning environment which supports diverse student learning abilities and addresses challenges students may face in pursuit of their education. Students with physical, psychological, or sensory conditions, be they chronic or temporary, can access the University’s Disability Support Services (DSS). DSS will assist students who are in need of accommodations in and outside of the classroom. The service is provided in accordance with the Americans with Disabilities Act of 1990 (ADA) and Section 504 of the Federal Rehabilitation Act of 1973.